← How to Create or Delete A Service in Windows XP? Resolution for “CFGFWK-60853” error while running Configuration Wizard. When trying to create a Domain using Configuration Wizard, while testing the database schema connection, I am running into an error. 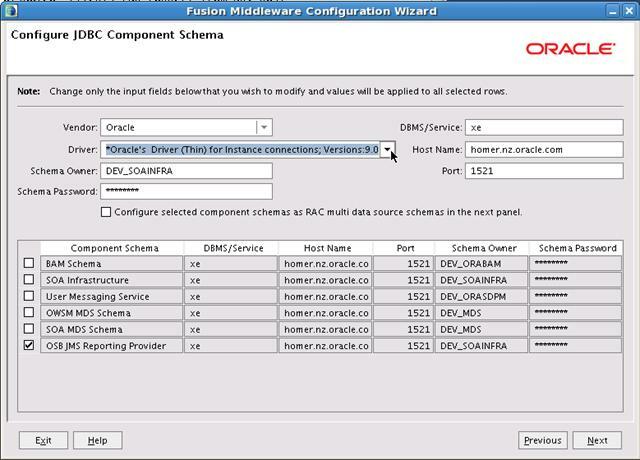 The configuration wizard reports the following error. Reason: In the previous wizard screen, I have modified the User name to all the Schemas as SYSTEM and provided the Password as Welcome1. Resolution: We should not modify the User name to the Schemas, Only Password need to be provided. This entry was posted in Service Oriented Architecture (SOA 11g), WebLogic Server 11g and tagged 11g, Configuration Wizard, Domain, OSB, Server, Weblogic. Bookmark the permalink. 3 Responses to Resolution for “CFGFWK-60853” error while running Configuration Wizard. java.net.ConnectException : Error connecting to server localhost on port 1527 with message Connection refused: connect. I changed the port to 1521 and i got the error..Any idea? Insufficient data while reading from the network – expected a minimum of 6 bytes and received only 0 bytes. The connection has been terminated. Any idea what’s the error is.. Thanks, I’ve noticed that my problem was what imran khan said. I’ve changed from Derby to Oracle and it worked like a charm.